Kristen Stewart has become the face of Balenciaga’s newest perfume, Florabotanica. And I must say that I’m disappointed with the ad. OMG, what’s up with her face? Is it really Kristen or… Marylin Manson? And what did they do with her jaw – definitely it’s overdoctored – she reminds me Sarah-Jessica Parker with that giant jaw! No, no! She looks like a female version of Michael Jackson. Only this one has a harsh face with a dead fish expression. Pff. I think Kristen looks far better in the ‘candid’ photo than in such kinda ‘arty’ perfume ad, which let’s face it, it a total fail. 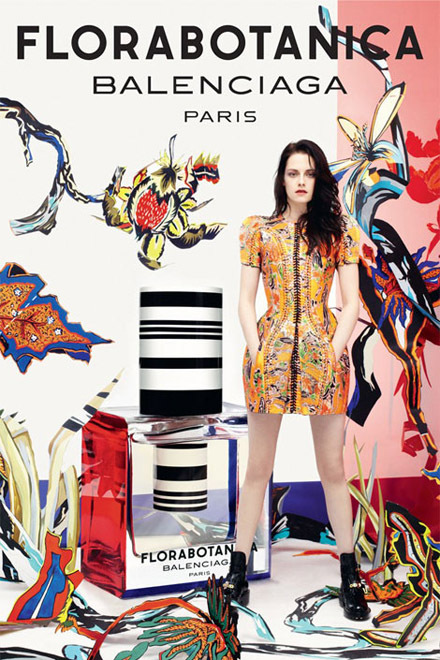 Florabotanica Balenciaga print ad with K Stew is the ugliest perfume ad poster I have ever seen. I’m not a big fan of KStew but I’m starting to think that Balenciaga designer Nicolas Ghesquière is trying to ruin her. From the horrible outfit at Paris Fashion Week, to the Met Ball fiasco, to the horrible casual Cannes look, to this walking dead of a perfume ad. I wouldn’t was to presume for anyone else but I won’t be buying perfume from a company that highlights a none too fresh looking zombie girl. By the way, the ad is incredibly similar to one they did five years ago with Jennifer Connelly, down to the grunge styling and weird stance. They even have Kristen Stewart in the same dress. It’s just a different background. The weird thing is, the ad from a while ago got criticized quite a bit. Now they are basically rehashing it? Stupid in my opinion. And this kinda ridiculous ads are supposed to make me buy the perfume? I can’t identify with her, she looks miserable. I don’t want to identify with Dakota Fanning and her ridiculous ad either – what’s wrong there? I just want to see a woman who’s comfortable and happy and attractive. Not a miserable actress or a teen putting the perfume bottle between her legs. Seriously, there are a lot of people who are just crazy.